I gave Chris Marsteller the link to this thread and he wanted all of you to know how much he enjoyed reading you thoughts. Lilly wins the award for coming the closest to getting the floorplan correct for the loft. Chris has been a delight to talk with and sends everyone his regards. That is so cool, Moonshadow. It must be nice for Chris to hear that his work really made an impression on us. I think Mick's loft and Josef's office were the most interesting and stylish decors I've on TV period! Does anyone know who designed the Art Deco frieze in Josef's Office? MoonShadow wrote: This is a wonderful article about the set design, go down to page 58 and enjoy! WOW! That article is INCREDIBLE & the pictures are fabulous. And it's very interesting to hear how they came up with the designs. Wow! Thank you SO MUCH for doing this! I've been trying to get my bearings through the FoS for so long! Really appreciated! Just poking my through all the comments and enjoying the views. Wonderful. Such talented people. Thanks for posting this! What a great article with fab pictures! But, what? No pictures of Josef's office?? Very inspiring work on the floorplans, and thanks a lot for posting the set-pictures! They used to be on another site as well but they have been taken down (and lazy me just saved the link, not the actual pics) so now I finally have them again! The PDF is very interesting- it's exactly the kind of thing that SHOULD have been on the DVD as an extra. Set design, wardrobe, make-up, take-outs, etc etc. It's the kind of information that fans want- too bad we got cheated out of that. There are plenty of take-out and making-ofs on youtube, but none on the DVD... ah- I'm sliding off-topic. Sorry! Wouldn't that have been lovely? Great to see this pop back up on active topics and take a moment for another wander through. Don't you know it? It's always my fault. francis wrote: Don't you know it? It's always my fault. Maybe we need to bump the "blame francis" thread? Actually, I was thinking just a few minutes ago, that one of the lovely parts of having active new members is that some of these wonderful older threads get bumped. The change is to the very dramatic light fixtures that flank the entranceway. Originally, I had drawn them as freestanding columns, but I've come to realize that these were actually L-shaped units which hugged the corners of the entrance where it opened into the loft. I don't think I'm going to be able to correct the 3-D version due to the constraints of the program, but I did want to set the record straight as much as possible. thanks so much for this. 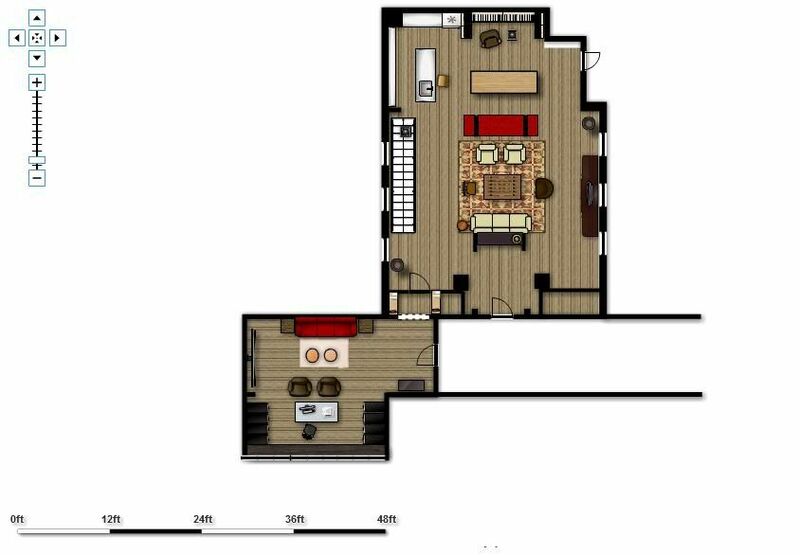 For the life of me, I could never figure out the floor plan, especially how the living area linked to the office. That was the hardest part for me, dsr. I finally got it watching and re-winding and re-watching 12:04am. That's when I finally had a moment.